Can We Embrace the Complexity of Mental Health? It has not been easy to be a mental health therapist in the world this week, especially here in Saint Louis. Hell, it hasn't been easy to be human this week. So much pain. So much violence. So much suffering. So much judgment. So much intolerance. And, yet I believe in the power of forgiveness; of ourselves and others. I believe in the power of recovery. I believe in our abilities to heal. I believe in the power of connection and love. And, I really believe in the power of courage. As a mental health therapist I have been educated, trained and my professional experience speaks to embracing all sides of everything. To not only seek understanding of all sides of everything but to also have empathy for all sides of everything. Sometimes, this can feel like a heavy burden to carry, especially when it comes to my personal life. It also means that I seek answers in many places and from many different angles. Such as been the case in the heartbreaking suicide of Robin Williams. And, needless to say, many angles have been presented. I have found myself frustrated and angered and I have found myself understood and thankful. Which I guess just brings us right back to that feeling, seeing and understanding all sides of everything. But today in one of my sessions I was able to bring the many angles to light with one of my fellow survivors of anxiety and depression. And, within that light, I think and hope, I opened up enough space for all of us who struggle with anything to breathe a little easier. As a survivor of mental illness I have been paralyzed by the depths of depression. The kind that hurts your whole body. The kind that leaves you exhausted in every way imaginable. The kind that destroys friendships. The kind that hurts your schooling or work. The kind where nothing means anything and yet everything seems like too much. The kind that is so dark that you simply cannot see any light; where you don't recognize yourself or anyone else for that matter. And, the kind that makes the impossible choice somehow seem like the only choice. As someone who practices recovery I know the choices I must make every day to acknowledge, embrace and treat my depression. The choice to take meds when I need them. The choice to really work in my therapy. The choice to practice self care. The choice to embrace the dark, move through it and let it pass because on some days that feels like all I can do. And, the choice to do this all with wholehearted courage. As a mental health therapist I understand the disease. I understand the causes, both environmental and genetic. I understand the chemical, emotional and spiritual make up of it. I understand that the disease is not a choice but fighting for recovery and holding onto hope is. And, I can understand that sometimes that choice just feels too difficult to make. It's not fair. Why do I have to suffer from depression? Why do I have to work so hard at just being okay? Why does it always linger somewhere in the background just waiting to cut off my light? It's too hard. I can't keep trying. It never gets better. I am exhausted. I don't want to fight any longer. Yes, I have depression (or anxiety or addiction, etc.) and I have to choose to do these things every day to be the best version of myself. Some days are good and some days are rougher. I don't need a reason or an excuse as to why I have depression. But, I can do the work to understand myself. Because this understanding will move me closer to who I am supposed to be and who I want to be. Everything can and will pass. We are never really alone. And, love, light and hope are always there. The last few days I have been plagued by opinions, judgments and the research coupled with my own experience as a sufferer, a survivor and a practitioner; with all of the voices above. What I was able to understand today with my client was that maybe we can embrace that it is all just really complex. That most of the time we will never get the exact, sure fire answer as to why or how. But, within that we can still understand. We can still have compassion, for ourselves and others. And, it is only through this compassion and courage that we can and will find our truth. And, that this can be and is enough. *If you’re struggling with some tough emotions or feeling lonely, don’t hesitate to call the Lifeline at 1-800-273-TALK (8255). To read more about my story and my recovery make sure to pick up a copy of Ever Upward: Overcoming the Lifelong Losses of Infertility to Own a Childfree Life,available October 1st at http://www.everupward.org. "Be free my guarded heart and I shall flourish. Tear down the walls that guard and I will thrive. Expose my inner depths and shine light on what's real. Afraid and brave, she will live and love freely and entirely. Watch her fly. Watch her grow." The words my client wrote as part of her work in The Daring Way™. Her work to choose to live her life wholeheartedly. Her work to choose to practice shame resilience. Her work to live with brave authenticity and to love courageously vulnerable. Her work to choose to change her life. The work I choose myself every day. The work I can only hope, wish and pray everyone chooses. I didn't know I wanted to be a mental health therapist until I lost one dream. I only dreamed that I would get paid to do something I love with every cell of my being. I never knew the depth it would provide in my own recovery. I have always felt honored to witness the choices my clients make to change their lives; let alone the permission to fight beside them. I have always felt honored to be the one to walk alongside them and push or pull them forward when needed. It is nothing short of a true honor. But, nothing could have prepared me with how much my career would change when I did my own work, when ever upward entered the world and when I earned certification in The Daring Way™. I feel blessed, I feel lucky and I am more grateful than words can contain for the honor it is to bear witness to someone choosing to change their life. 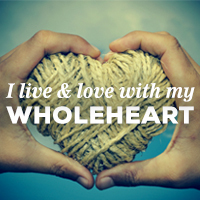 Choosing to live and love with their whole heart. Choosing to fight for themselves. And, I can only hope that owning my story helps my clients to own theirs. That my courage sparks their courage. That my fight helps them fight a little harder. Because courage begets courage and knowing you have someone fighting the good fight beside you can only help. This is not easy work. But, it is work that is worth it. Because, it can and will get better. But, we must choose it. Because, we deserve it. It will be the hardest thing you ever do, but I promise the work, the love, the light, the healing is here to pull you through. And, nothing is more heartbreaking than a battle lost*. Every day I see the change. Every day I feel the courage. Every day I witness someone choosing themselves. Every day I see the world change one person at a time. And, every day I thank God for the chance to wholeheartedly witness it all. *If you're struggling with some tough emotions or feeling lonely, don't hesitate to call the Lifeline at 1-800-273-TALK (8255). This post linked to Amateur Nester's Link-Up. To read more about my story and my recovery make sure to pick up a copy of Ever Upward: Overcoming the Lifelong Losses of Infertility to Own a Childfree Life, available October 1st at www.everupward.org.